Written with the passion of an obsessive, Nicotine addresses a lifelong addiction, from the thrill of the first drag to the perennial last last cigarette. 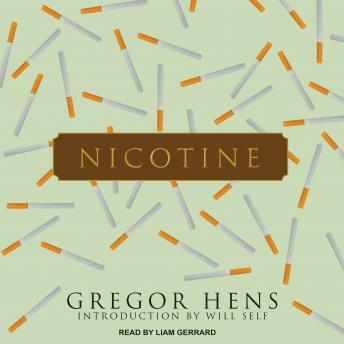 Reflecting on his experiences as a smoker from a young age, Gregor Hens investigates the irreversible effects of nicotine on thought and patterns of behavior. He extends the conversation with other smokers to meditations on Mark Twain and Italo Svevo, the nature of habit, and the validity of hypnosis. With comic insight and meticulous precision, Hens deconstructs every facet of dependency, offering a brilliant analysis of the psychopathology of addiction. This is a book about the physical, emotional, and psychological power of nicotine as not only an addictive drug, but also a gateway to memory, a long trail of streetlights in the rearview mirror of a smoker's life. Cigarettes are sometimes a solace, sometimes a weakness, but always a witness and companion. This is a meditation, an ode, and a eulogy, one that will be passed hand-to-hand between close friends.